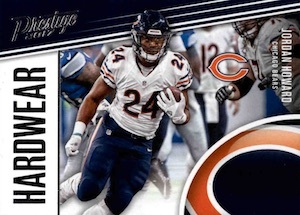 An NFL constant under the Panini regime, 2017 Panini Prestige Football sticks close to home with a familiar layout. This includes an average of four autographs in each hobby box. 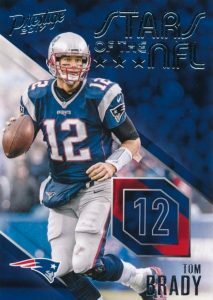 2017 Prestige is fundamentally similar to the 2016 set with four jumbo packs per box that each contain 40 cards. 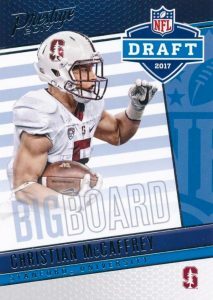 The base set boasts the earliest rookie cards with updated NFL team designations based on where players were drafted. These RC cards average 10 per pack. There are also parallels including Xtra Points Black (1/1) and Printing Plates (1/1). 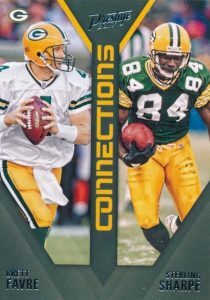 In addition, Connections inserts put two players on one card with a design that splits the card vertically down the middle. All the inserts combine to average six per pack. 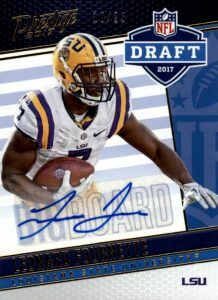 Led by the incoming draft class, the 2017 Panini Prestige Football checklist includes signed inserts like the main Rookie Signatures set, along with Blue Chip Prospects Ink and NFL Passport Ink. 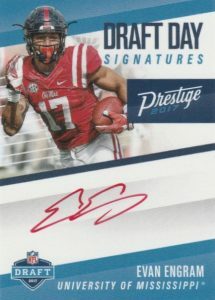 Signed on-card, the limited Draft Day Signatures line debuts Gold Ink and Silver Ink versions. 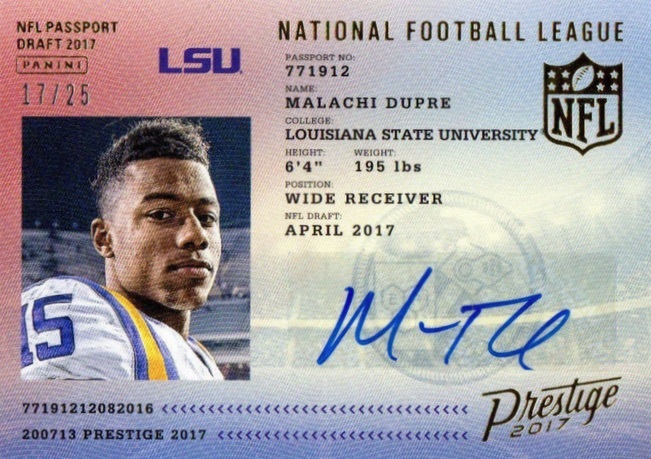 Beyond the newest NFL players, Prestige also features established stars and retired greats with autographs numbered to 100 copies or less. Among the options are Legendary Signatures and Veteran Signature cards. PARALLEL CARDS: Xtra Points Blue, Xtra Points Red, Xtra Points Green #/150, Xtra Points Purple #/100, Xtra Points Gold #/50, Xtra Points Platinum #/25, Xtra Points Bronze #/10, Xtra Points Black 1/1, Printing Plates 1/1*. PARALLEL CARDS: Xtra Points Green #/150, Xtra Points Purple #/100, Xtra Points Gold #/50, Xtra Points Platinum #/25, Xtra Points Bronze #/10, Xtra Points Black 1/1, Printing Plates 1/1. PARALLEL CARDS: Xtra Points Platinum #/25 or #/15*, Xtra Points Bronze #/10, Xtra Points Black 1/1. PARALLEL CARDS: Xtra Points Red, Xtra Points Platinum #/25, Xtra Points Bronze #/10, Xtra Points Black 1/1. 20 card. Shop on eBay. 18 cards. Serial numbered #/25. Shop on eBay. Base Blue Ink or Black Ink is limited to 89 copies or less. PARALLEL CARDS: Red Ink (25 copies or less), Green Ink (10 copies or less), Silver Ink (5 copies), Gold Ink (1 copy). PARALLEL CARDS: Xtra Points Platinum #/25 or #/15, Xtra Points Bronze #/10, Xtra Points Black 1/1. Card #26 Jimmy Johnson is the former cornerback, not the coach. PARALLEL CARDS: Xtra Points Blue, Xtra Points Platinum #/25, Xtra Points Bronze #/10, Xtra Points Black 1/1. PARALLEL CARDS: Xtra Points Blue, Xtra Points Red, Xtra Points Platinum #/25, Xtra Points Bronze #/10, Xtra Points Black 1/1. 20 cards. Serial numbered #/100. Shop on eBay. PARALLEL CARDS: Xtra Points Platinum #/25, Xtra Points Bronze #/10, Xtra Points Black 1/1. 2 stars. I do not buy this produce to many short that come 1 case and make it to hard to put a set together. I will Not buy this year. still no checklist ? Oh wait hardly anyone has the Panini Classics for sale on EBay yet — wonder why ? junk junk junk…the hobby is in a sad state with Panini controlling football. !st pack I opened was xcited to see the auto, got 150 lousy panini points,Major Bummer !!!! Don’t know why every ones complaining about this product. I pulled a Mike Williams 10/10# autograph out of it so I was happy to say the least. 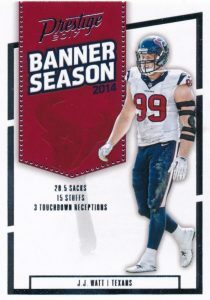 And what’s wrong with base cards people do actually still make sets, and it’s nice for team collectors also. On top of the Mike Williams pulled a Josh Reynolds high number short print. This product is a money maker if you know what you are doing……..i have sold (4) 290 card base sets for $90, $90, $90, & $100. Tons of parallels , tons of inserts which you can sell in lots or subsets…….and a lot of parallel auto’s. Hobby is strong right now for sellers as most are doing group breaks so people looking for specific cards and buying a ton. affordable products like this to bring in new and young collectors our hobby and business will die. I still enjoy putting sets together as well as pulling the elusive auto or memorabilia card. 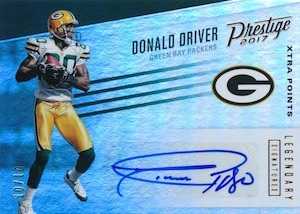 I have a large quarterback auto collection and I love this product. gives me a chance to get all the qb’s who never make it to the regular sets. all the qbs who end up as free agents get a chance but don’t make a roster. got guys you wouldn’t remember. also got lucky pulled trbisky #d to 10 auto and mcafferty print plate auto . If you want a bunch of OT, DB, and LB crap this is the set for you. Reminds me of Topps back in the day. Made a pretty nice set into a run of th e mill low end set. 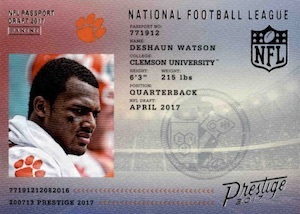 Come on Panini….tired of this. 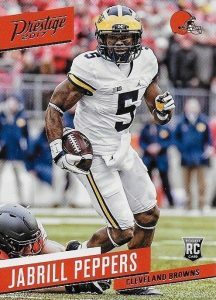 Topps might have to come back and save us football card collectors! Just been back into collecting a year and honestly the market reminds me of the junk era. 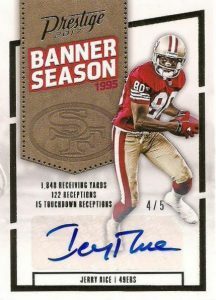 The base cards of most sets are absolutely worthless yet it’s still $5 a pack minimum. Everything is over produced and seller dominated. Too many greedy, rude, selfish people involved now. When I was growing up sport cards were collected primarily by kids and young adults. Now it’s a bunch of grown men bickering like children who have lost the meaning of joy it brought us as kids. That said Im enjoying collecting this set with my kids. 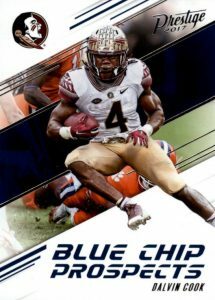 We’re not picky and care little for autos, we just enjoy pulling the cards of our favorite players and teams. These cards look great and there’s a ton of fun inserts. Lighten up guys, unless you have a huge collection of vintage valuables to auction you aren’t gonna get rich selling football and baseball cards so just have fun with it. I am still missing BUCKY HODGES and CALEB BRANTLEY from the Rookie Signatures to complete the set. Have loved completing this collection. If you send me your address and what 12 cards you have missing I will gladly send you them if I have them. I purchased 3 cases of these cards and have loads of doubles. So I see there are 2018 version but NO mention of a checklist or any box sales anywhere — even the Panini website — whats going on here ? Anyone that knows cards have an answer ?